As far as the real estate market goes, there’s not much you can do to sway things when you’re trying to sell your home. That doesn’t mean you need to be stuck trying to sell your house month after month. 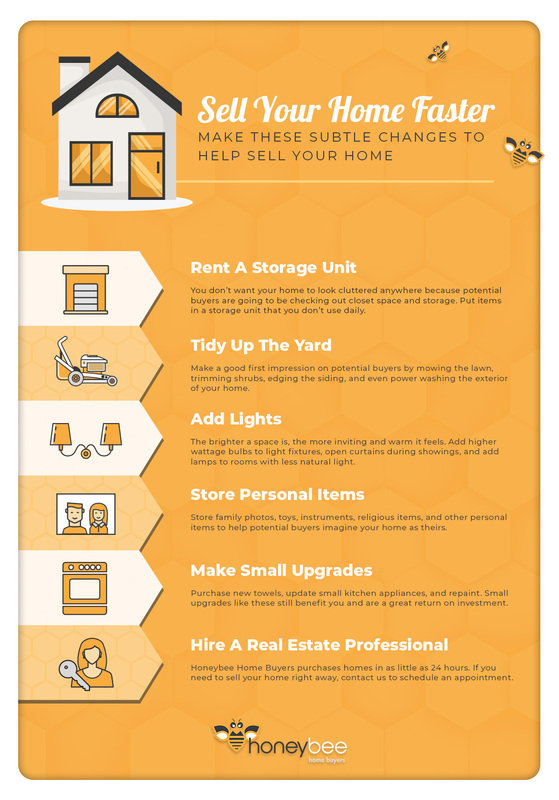 There are small changes and upgrades you can make to your home to give it a little more curb appeal and give it an extra homey environment that buyers will appreciate. If you need to sell your house immediately, you have other options as well. Honeybee Home Buyers is a team of real estate professionals that assess properties and purchase them in as little as 24 hours. Regardless of the reason you need to sell your home, we are here to help. Contact us today to set up an appointment. When buyers are touring your home, they’re going to take a peek at a lot of amenities — your closets and storage spaces being a few of them. Don’t let boxes and clutter turn them away. If you have a lot of belongings, renting a storage space to declutter your home will help improve the overall feel of the house. The first thing buyers see when they pull up to your house is the front yard and the exterior. Give them a good first impression by making sure the grass is trimmed, weeds are pulled, shrubs are pruned, and sidings are edged. You might also consider power washing the exterior of your home, as well as the driveway and front porch, to wash away any dirt or debris. 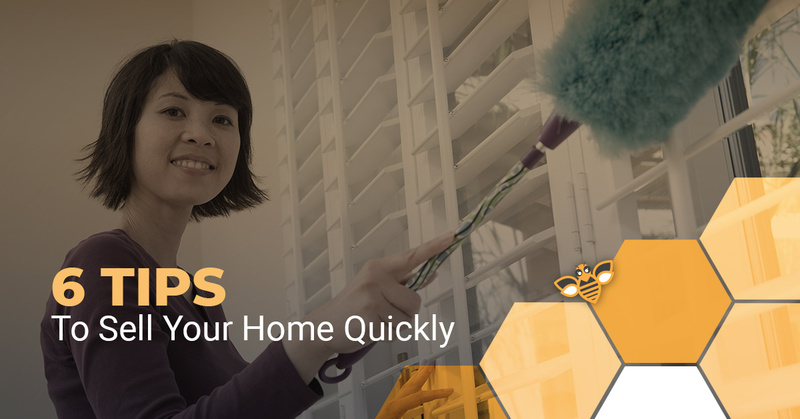 Whether it’s with higher wattage bulbs or opening up more curtains, brightening up your home for showings helps the house feel warm and inviting. Natural lighting is one of the best ways to do this, but if areas of your home don’t have very good windows you can add a lamp or two to make sure each space has as much light as possible. When a potential buyer is touring your home, they’re trying to imagine themselves living there. For this reason, you should store things like family photos, instruments, toys, religious items, and sports equipment. You may still live there, but for selling purposes, your home needs to look less personalized so that viewers can imagine their personal items in the space instead. A space will also look larger with less items in it. If your bathroom towels are looking a little dingy, it’s time to upgrade them to improve the appearance of your bathroom. Are your kitchen appliances outdated and mismatched? Upgrade them to a modern-looking, matching set if you don’t store them. You can also update your home with a fresh coat of paint in each room. The best part is that you get to keep most of these items, and the fresh paint is an easy return on investment because of how it improves the look and value of the house. If you’re struggling to sell your house even when you follow these tips, Honeybee Home Buyers can help. If you need to sell your home right away, whether it’s because of a change in financial situation, a divorce, a death in the family, or any other reason, we may be able to purchase your home from you in as little as 24 hours. Give us a call to set up a viewing. There’s no need to clean or have anything serviced. If your house is within our criteria, we will purchase it exactly the way it is. Don’t wait any longer, contact us today to schedule an appointment.